Potable Pizza: For the month of October, Pasadena’s Trattoria Neapolis is offering a Pizza Cocktail. 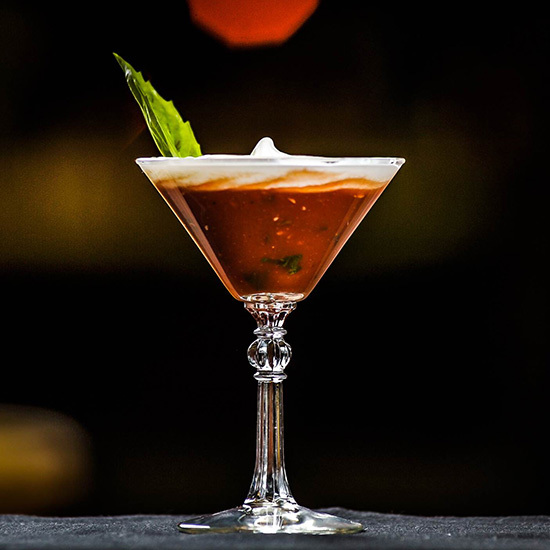 Made with tomato water, basil-infused vodka, ghost pepper-infused vodka, porcini powder and muddled basil, the cocktail is shaken and topped with Parmesan and mozzarella foam. According to LA Weekly, the flavor is “scarily accurate” and tastes as if you dropped a slice of pizza into a Vitamix with some vodka. BBQ Odor-Emitting iPhone App: If you don’t live in one of the country’s barbecue centers like Texas or Tennessee, you’re probably not smelling enough grilled meats. A Japanese company can fix that. The Hana Yakiniku is a small device that plugs into the headphone jack of your iPhone and, in conjunction with an app, emits one of three smells: ribs, buttered potatoes or cow tongue (a popular BBQ cut in Japan). Those eager to add some meaty aromas to their lives will have to wait just a bit longer; the Hana Yakiniku goes on sale November 15. Texting Teapot: The kettle of the future is here. Say goodbye to the old screaming kettle and say hello to the iKettle, which politely texts you to let your know that it is boiling. It also lets your control the temperature of the water via your iPhone and will ask you if you would like a fresh boiling pot when you come home at the end of the day. It’s the next best thing to a British robot butler currently available on the market. Sprite Cures Hangovers: Put down the ginger ale. If you’re suffering from a hangover, a recent study says that Sprite is the best cure. Researchers at Sun Yat-Sen University in Guangzhou, China tested 57 beverages including teas, herbal drinks and a selection of sodas (it is unknown whether they thought to include Bloody Marys, coffee or coconut water in the test group). Soda water also tested well, while a drink made with hemp seeds made hangovers last even longer. SpaghettiOs Cupcakes: Way back in 2011, F&W predicted that savory cupcakes would be a trend. While we still think there’s a place in the world for these lasagna cupcakes, we don’t see a future for SpaghettiOs cupcakes topped with Velveeta frosting and Goldfish sprinkles.